If you are interested in a future workshop, please feel free to contact me via email. Customized classes are available upon request. join me for an intimate pie workshop at my NYC home studio! I am so excited to finally bring this pie workshop to life. 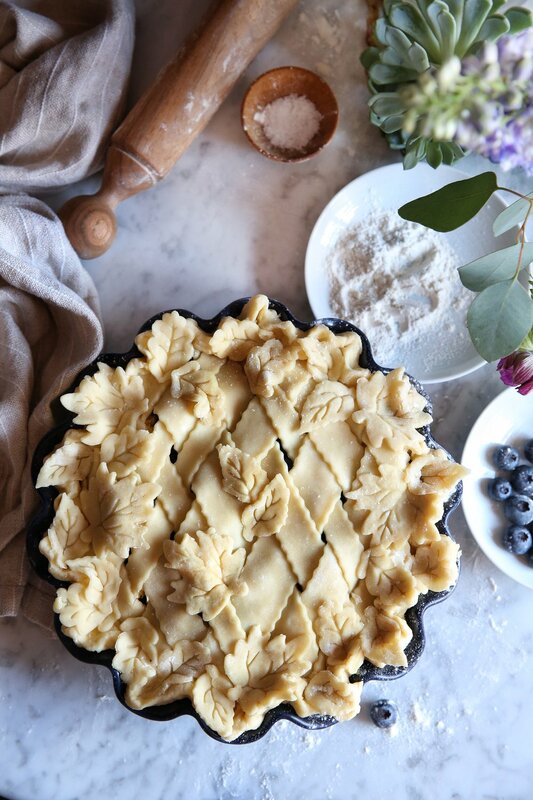 Whether you’re an experienced baker, food blogger, aspiring stylist, or just looking for the most epic pie to post on Instagram for Pi day, please join me as we explore my favorite tools, types of dough and their usage, and foolproof techniques. I really can’t wait to bake delicious pies with you, and show you how I simplify the process for equally beautiful results. We’ll cover everything from composing quick and decorative tarts to more elaborate double crust pies using a combination of lattice work and cut outs. I truly believe that flavor should never be compromised by design; we’ll discuss where to draw the line on a decorative crust (pastry to filling ratio is very important! ), but I’m also all about smart techniques that allow more time to create an intricate design. By the way, you're going to love my trick to skip blind baking! Classes cap at three people per day to maximize one-on-one time with me, and to maintain a productive and comfortable atmosphere—and of course, there will be plenty of time for us to cover all of your pie making, filling, baking, and decorating inquiries. We'll discuss a variety of topics throughout the day, you can see them listed below under the itinerary. This class is a combination of baking and styling, but we will make sure to leave plenty of time to talk about Instagram. All skill levels are welcome! By the way—Hi! I’m Judy and I’m a food stylist based in NYC. For more about me, take a peek at my bio. And I’d love to hear from you! Please feel free to reach out to me via email with any questions. I can’t wait to meet you and host you for a day of creativity in my home! *All payments are due in full and non-refundable. You may find a replacement for yourself should you not be able to attend. YES! You are welcome to bring a DSLR or Mirrorless camera, but most importantly bring your camera phone. Though this is NOT a photography class, we will discuss basic photography, as many of the topics we cover go hand-in-hand. Our focus will be on honing your eye, composition, utilizing props to enhance your styling, and establishing a point of view with your pie as the hero. During our one-on-one time portion in class, if you would like a Instagram portfolio review, it will be helpful if you have photos readily available on your phone. REMINDER: Don’t forget to format your memory cards and create space on your phones! Note: At this time we are unable to accommodate gluten-free classes but hope to in the future as I develop GF pastry recipes.. But we will do our best to accommodate other food allergies. Everyone will leave with atleast one pie to take home or show off to friends, and we will have several to taste and style during class. You will also take home pie dough along with some complimentary gifts from our sponsors.